To all who come to this happy blog: welcome. Anyone who has visited a Disney park has undoubtedly been captivated by Audio-Animatronics (or AA’s). My fascination with AA’s started at a young age, and I’ve always enjoyed learning about them. I also love to discuss them with other people, so I’ve decided to put together a high-level overview of their constantly evolving technology. 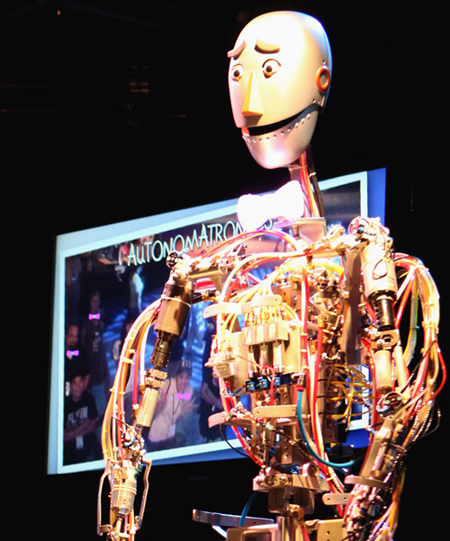 To understand machines as complex as Audio-Animatronics, it helps to first understand control systems. A control system in its most basic form is an input that produces a desired output. Inputs and outputs are classified as either binary (also called digital) or analog. A binary input or output is one of two discrete values (i.e. on or off). An analog input or output is a varying value. How do you know if the value is designated as an input or an output? You have to think like a controller. The controller is the reference point. Information that the control system receives is an input and information that the control system sends is an output. Simple enough? To illustrate, I’ll use an example that most people can relate to before moving on to the inner workings of AA’s. A control system that most people encounter on a daily basis is the thermostat in your home. Your thermostat is a controller. Inside that controller is a temperature sensing element. Since temperature is a varying value, it is considered analog. Your thermostat receives an analog input from the temperature sensing element. Your thermostat has been programmed to maintain a specified room temperature, so when it receives that analog input, it will confirm whether or not the specified room temperature has been satisfied. Your thermostat then sends a binary signal (on or off) to your air conditioning unit. Your air conditioning unit will continue to cycle on and off to satisfy the specified room temperature. 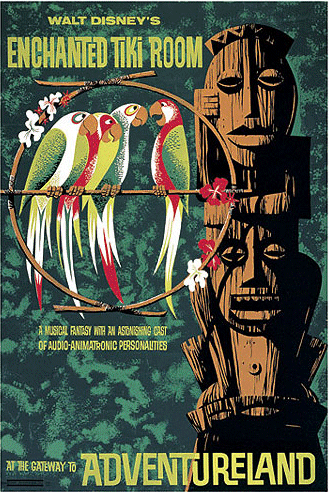 One of Walt Disney’s first endeavors with AA’s was with Walt Disney’s Enchanted Tiki Room in Disneyland back in 1963. What made this control system so revolutionary was how WED Enterprises combined movement with sound – hence the “Audio” in Audio-Animatronics. In this instance, a score is prerecorded and programmed on magnetic film/tape. The control system is a group of gigantic machines that play back the programmed film in the desired sequence. The film produces a set of signals or tones. Every time a tone sounds, a metal reed vibrates. The signal and metal reed are the system’s binary input. This metal reed closes an electric circuit which triggers a solenoid. The solenoid actuates a pneumatic valve which opens and allows air to flow. The Tiki Room’s outputs are its pneumatic valves/cylinders. That’s why you can hear air hissing sometimes in many of the attractions with AA’s. This particular system is fully binary, so the valves (the outputs) are two-position: open or closed. A simple movement that results from opening a pneumatic valve might be to open a bird’s beak. To summarize: control signal closes circuit and solenoid actuates air valve which opens beak. That’s just one movement. The Tiki Room is full of countless other movements set to a full musical score. Mechanically, it’s a simple system, but it takes a lot of time and effort to make everything work properly and to produce an entire show. We’ve made it through the basics, and each new development builds upon the previous incarnation. Next comes the 1964 World’s Fair in New York with WED’s first human AA (which were called A-1’s by the company internally), President Abraham Lincoln. Abe presents new challenges. First, this AA is considerably larger and heavier than the Tiki Room’s birds, and second, a human’s movements are not two-position. Our movements vary. To address these challenges, WED uses hydraulics in lieu of pneumatics on some of the heavier/larger limbs and they develop an analog control system. Both a binary system and analog system are used for Mr. Lincoln. The way the analog system works is by varying voltage to the actuators of the pneumatic or hydraulic valves which results in a full range of motion. The control signal is not on/off; it fluctuates. Every analog input is programmed individually on the magnetic film. Then each piece of tape is combined into a single reel and synched with the dialogue and music. You can see the finished product in Walt Disney’s Wonderful World of Color “Disneyland Goes to the World’s Fair”. Walt gives a great introduction and we get to see Blaine Gibson, the sculptor who created Lincoln’s face. 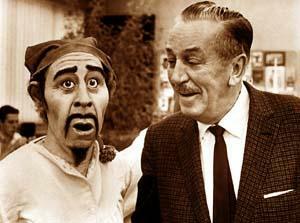 In the same special, Walt goes on to discuss the Carousel of Progress. This is where we get to see one of the methods by which WED was able to program the desired analog movements. Wathel Rogers, an Imagineer, is shown wearing a harness device that records his movements onto the magnetic film. The next major milestone is in the late 1960’s with the introduction of the Digital Animation Control System or DACS. DACS has the capability to program movements on computer disks rather than tape. With the advances in computer technology, Imagineers can program AA’s from a control board instead of wearing the cumbersome harness. Also, eliminating the tape allows for easier addition, deletion, and shifting of movements in a sequence. Side note: This system is still in use today but has gone through multiple upgrades and improvements. DACS does not only control AA’s; it also cues lighting, sound, and other effects. This is the control system seen in almost every Walt Disney World television special when the cameras go inside the Utilidors. We’ve made it to the 1980’s! At this point, Imagineers are a bit annoyed by the seemingly harsh movements that most of the AA’s exhibit. If the movements are quick, the limbs shake which makes the whole AA move. They end up having to slow the movements down to prevent shaking. This is not a desirable solution, so Imagineers develop a better technology to correct these issues. They call it “Compliance”. Compliance allows limbs to move slightly past their programmed end location to absorb shock and soften the finish of the movement. This is all made possible due to more robust computer systems and programming technology. In 1989, the first AA to incorporate compliance shows up in Disney’s Hollywood Studios (Disney’s MGM Studios at the time). 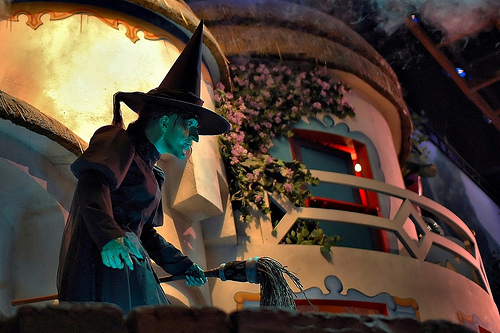 The Wicked Witch of the West is unveiled at The Great Movie Ride. The company calls this type of AA an A-100. Because of the exponential increase in channels of movement, it can take up to eight hours to animate one second of an A-100. Keep in mind that up to this point, every AA’s inputs are prerecorded. A-100’s are still the most recent incarnation of AA’s, but as materials are refined, control systems become more sophisticated, and Imagineers continue to tinker, AA’s movements become more realistic. I was really impressed when I saw a clip of Ursula in The Little Mermaid: Ariel’s Undersea Adventure which opened in Disney California Adventure in June 2011. In the early 2000’s, Disney comes up with what they call the “Living Character Initiative”. This encompasses both AA’s and traditional motion picture animation. It’s a way to enhance the in-park experience by allowing guests to interact with characters. The difference between standard AA’s and Living Character Initiative AA’s (or animated images) is that some of the inputs for the LCI characters are NOT prerecorded. These inputs rely on operator intervention. Typically a cast member is camped out nearby programming inputs in real time. 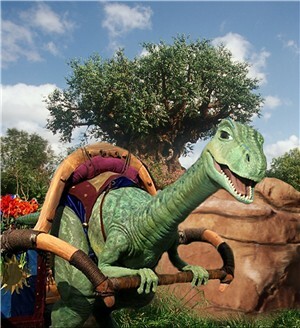 An example of a development from the Living Character Initiative is Lucky the Dinosaur. Lucky is the first AA that can walk independently. The cart he tows behind him conceals the control system and power source. One of the reasons Lucky can roam freely is because his limbs are actuated electrically, so compressed air and hydraulic pumps are not required. Lucky uses some prerecorded movement sequences but some of his actions are controlled by a hidden operator. This allows Lucky to interact with guests. Other LCI creations include Turtle Talk with Crush, Monsters Inc. Laugh Floor, Push the Talking Trash Can, WALL-E, and Muppet Mobile Lab. The future of AA’s is so advanced that Disney had to come up with a new name for them: Autonomatronics. By the way, both “Audio-Animatronic” and “Autonomatronic” are trademarked by Disney. The Autono- prefix is used because these characters do not rely on operator intervention; they function autonomously. 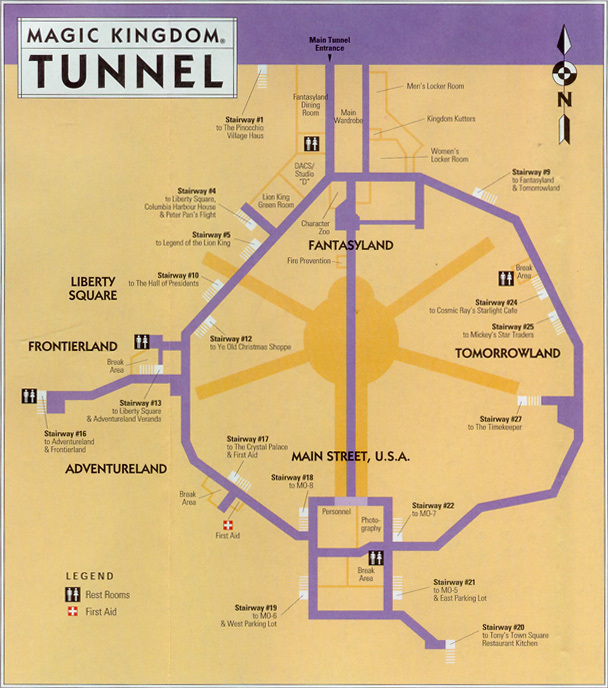 The term is first mentioned on Twitter in reference to the D23 Expo in 2009. Disney introduced a new Autonomatronic named Otto. The control system for this new generation is capable of receiving inputs from various sensing devices. Devices might include occupancy sensors, cameras, or microphones. The system first receives input information. Then the controller analyzes the input, selects the desired output, and sends a signal to trigger the end device. If you remember the thermostat example from way back in the beginning of this post, the new Auto’s are similar in regards to inputs and outputs. They operate in response to external stimuli as sensed by the system instead of by a human operator or by using a prerecorded sequence. However, the Auto’s have a lot more data and much more complex control algorithms than a home thermostat. I came up with a possible scenario of how Autonomatronics might be used. I’m not sure if Disney is already implementing this sequence; this is simply to illustrate the technology. An Auto might have a thermal imaging camera imbedded in it. The control system could then use that image to identify how many bodies are in the immediate area. That quantity would serve as the analog input to determine what dialogue and/or movements are performed. Again, this example is completely arbitrary; I don’t know if the company is actually using thermal imaging in this way. I look forward to the future of both Audio-Animatronics and Autonomatronics. Who knows what their capabilities will be? Maybe we’ll be able to hold entire conversations with them and be BFF’s. I know this is a pretty dry topic for a blog post with a lot of emphasis on technology and all-around nerdy stuff, so I appreciate anyone who suffered through reading the whole thing. If you have any comments or anything you wish to add, please post them below. I thought it was pretty much magic and the Wizard of Oz directed all of the actors. Yep. Just like electricity and television – it’s magic! Thank you! It took a very long time to research and write. I appreciate the feedback! Also… May I ask what system Small World runs on? Hello! From what I understand, it’s a small world dolls and animals use a combination of hydraulic and pneumatic systems similar to the AA’s in Pirates of the Caribbean. Hope you had a wonderful vacation!